Although I’ve never been a ‘baby’ person, (not interacting with my nieces and nephew until they were at the moving-around-on-their-own stage!) I am very much a child-friendly person, and Dan and I are both really looking forward to sharing everything we have with a little person sometime around the 4th October later this year. I am sixteen weeks pregnant now, and having kept this secret for longer than most do, it really feels like I can no longer remember a time before I was pregnant and going to bed at a ‘normal’ time. I knew very early on that I was pregnant, just one or two days after I would have been three weeks. I experienced very strong cramps for a couple of days and just generally didn’t feel great in the lower tummy department. I had three pregnancy test sticks so took them on consecutive days. Each day the little pink line got a little darker, confirming the pregnancy I knew by this point existed. Unsure of what to do I rang the doctor to ‘ask to speak to someone as I thought I might be pregnant’, – only to be told no-one would speak to me until I reached eight weeks. Apparently there is a large chance of miscarriage in the first eight weeks, so you don’t sit on the midwife radar until then in case something does happen. Four weeks is a really long time to wait when you can’t explain to anyone why you are feeling so rubbish! At six weeks I ran the first 20 miles of the Thames Trot and also my first fell race. Earlier that week I had spoken to the midwife team at Kettering Hospital who reassured me that I would be fine to run at the ultra event, so long as I didn’t feel in pain and there was not any bleeding. Despite this, I felt a little niggle in the pit of my stomach that if something did happen it would have been down to my stubbornness to complete the event and this played a large part on the reason why I pulled from the race before reaching halfway. In comparison, I felt great running the 14 miles at Charnwood Hills the following day. The only problem being that by week six my breasts had really started to grow and my sports bra was becoming increasingly uncomfortable by this point! I had made the decision to share my news with the friend I was running with that day and she had suggested that lots of runners seem to wear two bras whilst pregnant. I pointed out that I could barely fit into just the one now! 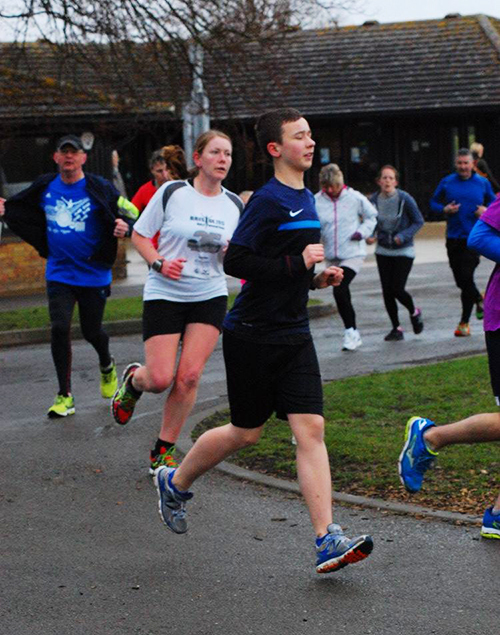 From the week following Thames Trot I began to get morning sickness – although it hit me hardest in the evenings. I would have to snack throughout the day every few hours in order to feel relatively normal. An empty stomach was a sure-fire way to feel awful. I was lucky in that I never actually threw up, although at times I thought that throwing up might make things better as I felt so bad! I took lots of pre-packaged things like croissants, crisps and apples to work so that I could open them/start them as and when I began to feel iffy. Dan also began bringing me a sandwich home from work each night so that I could take it in with me the following day which was a godsend. By this point I was so tired there were some nights it was pushing 8:30pm and I was ready for bed. he combination of gradually feeling worse throughout the afternoon and being sapped of all energy meant that I just wanted the day to be over with as soon as possible! That, and my three-four nightly loo visits keeping me up at least! 😉 I had to really prioritise with my school work. Luckily, I had already completed most of the essential year 11 marking before the sickness began, but my early morning starts became no earlier than 5:15-5:30am starts at this point. My body really seemed to need that regular rest! Running took a real hit for a few weeks, as most of my running sessions tend to take place in the evenings after work – and I just really did not feel like it after a full day of faking feeling fine for staff and children at school. When I was in my eighth week of pregnancy I caught a bug and it really knocked me sideways. I was up with coughing fits for over an hour every night and I felt increasingly worse and weak on a daily basis. I could barely eat anything, yet at the same time, felt so ill when I didn’t. I ended up having the Monday and Tuesday off from work, returning on the Wednesday only because I had top set classes, so hoped they would be fairly easy to lead, and to try and regain some strength for parent’s evening the following day. There were two points across Wednesday where I just had to lean against the wall as I felt so weak. I ran a few odd miles through these two weeks but my energy had dropped completely and I really struggled to not break out into a full-blown coughing fit when pausing during a run. During one seven mile trail run with friends during the second week I ended up coughing so badly that I gave myself the worst migraine I have ever experienced and sent myself straight to bed on arriving home. 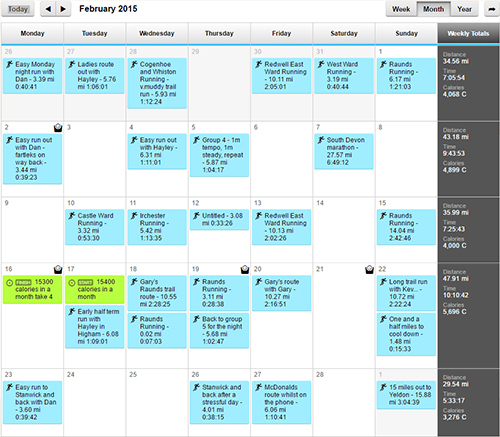 As you can see, most of my running during the lowest times was taking place on the weekends. 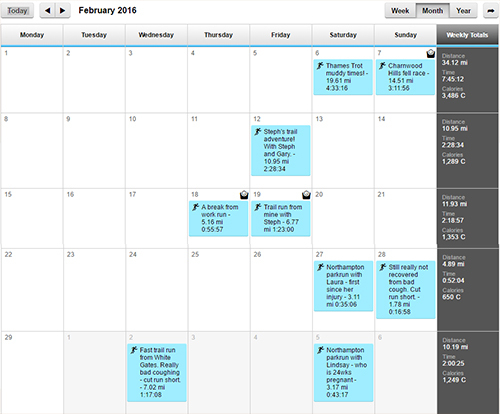 My parkrun visits became more frequent during the last few months (with my 50th parkrun taking place yesterday!) and, as Laura was returning from injury it made sense to run with her to catch up with the gossip, and also have a reason for my times beginning to drop. Although to anybody that questioned my times/lack of running with club I mentioned how ill I had been, – a genuine reason that seemed to be accepted by most for why I hadn’t been clocking my usual miles each week. Luckily, my energy started to return and my cough began to disappear by week ten and it was the end of this week that I finally saw the midwife for the first time. Initially booked in for when I had been eight weeks pregnant, I had rung to rearrange when I had already missed two days of school that week due to illness. I thought I would begin to feel more at ease following my midwife appointment, but to be honest, all she really did was write down all my details, along with details about Dan’s medical history and give me my pregnancy packs of samples and information. Please ignore the hair – this was that incredibly windy day we had a few weeks back! As you can see, I do have a few maternity tops now. Mainly because the work shirts I own no longer fit around my chest! My tummy hadn’t grown loads by this point, although by week 12, the baby was apparently the size of a clementine. Luckily, the scan date we had been sent in the post fell during the first week of the school Easter holidays so there was no need to try and get a day off work when I had not yet shared my news. For your first scan you have to drink two pints of water an hour before arriving at hospital. For someone whose bladder has already shrunk to the size of a small sprout this was a feat! I managed it…Only to receive a phone call a few minutes later to say that my scan would have to be rearranged as the sonographer had been sent home ill! Luckily, we managed to rearrange the appointment to that coming Friday instead. Neither of us clicked the date of the Friday until we woke up and April Fools Day messages were popping up everywhere. I’d already told my parents on Mother’s Day at the start of March. We hadn’t planned on sharing the pregnancy with others immediately after the scan, but Dan decided that the opportunity of April Fools Day was just too good to pass up when it came to telling his friends. He had received a message from a friend in a group chat that morning stating that their upcoming wedding was being called off as him and the bride-to-be had been arguing for a while now. The other guys immediately called April Fools on him. We waited until we had been to our scan before Dan also added a comment to the group chat, – ‘Guys, I have some news…I’m going to be a Dad!’ Dan’s message was met with more April Fools calling, followed by a couple of the guys pointing out that Dan was supposed to have made his attempt before midday (it was now close to tea time). Dan remained silent in the conversation as the others began to doubt themselves that it was a ‘joke’ and it was rather entertaining watching the messages scroll as the others weighed up whether or not Dan had been telling them the truth before he put them out of their misery by sending over the scan photo. Even then one of them thought that Dan might have photoshopped the image to contain my name! 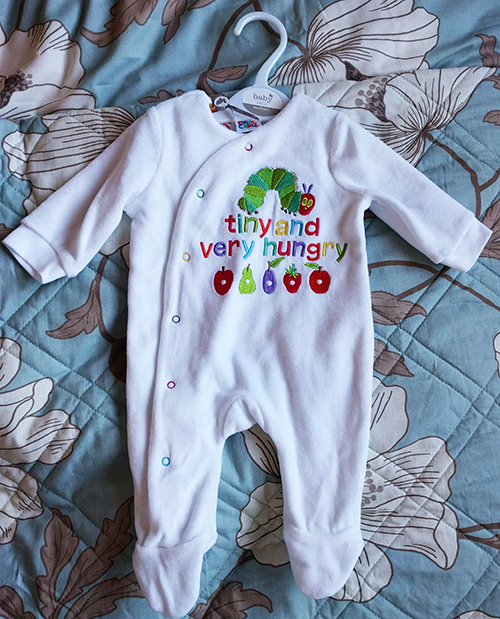 ^ The very cute sleepsuit my brother bought for us. Although I was a little alarmed when my Mum said that she hopes it fits and the baby isn’t too big! This suit is most of my torso in length! It’s been this week that I’ve really begun to notice my pace dropping on runs. I’ve been lucky up until now that a sub 10 minute mile still felt fairly comfortable. I haven’t attended many trail runs since finding out that I was pregnant as I have been worried about falling whilst out in the dark. Now that the clocks have changed though and it’s light outside until I’m almost heading for bed I decided to head out on a trail run with the usual crew on Wednesday evening this week. I was hanging off the back of the run. Something which has never been an issue for me before on the Wednesday evening trail runs. A couple of friends hung back with me for most of the run and it was almost a relief that I am now able to tell people and explain my sudden desire to walk the steepest of hills and why my pace has dropped so significantly. Did/will you run/exercise throughout your pregnancies? Congratulations again! The April fools thing is brilliant, and the sleep suit is adorable – I loved the book as a child. I don’t know if you are looking to read other blogs about fitness and pregnancy but Peanut Butter Fingers did monthly updates during her pregnancy which I thought were really interesting. Yeah I kept up with the PBF blog as she was pregnant and I’ve now been catching up on her original posts again. Thanks. Julie managed to keep her pregnancy hidden for a lot longer than I did! I’m definitely on the lookout for pregnancy and fitness related bloggers, especially those who ran throughout pregnancy so that I have something to refer to. That caterpillar suit is so cute! Andy is now an uncle and we bought our niece the cutest Kermit top from H&M- you can get such lovely things for babies now. I am not surprised that your pace dropped so much, especially with being ill as well as being pregnant. A lot of my friends have said the first three month are the hardest, with feeling the worst, plus not being able to tell people why. Ah, I shall have to hunt out the Kermit top next time I’m by H&M! I’m hoping that when we finally achieve a pregnancy that sticks (as opposed to the myriad ones that just haven’t) I’ll be able to keep going running-wise. My lovely ob-gynae friend says that the embryo doesn’t really care what you’re doing that makes it bounce up and down, it’s down to how you feel about it all. I do remember a disgruntled rugby friend (he’s super-fit, and spent his entire time at business school running round in shorts) telling me how he’d been beaten over a 10km (or was it half?) distance by Paula Radcliffe when she was about 6 months pregnant. He blamed the extra blood flow she had going round her system. Haha! 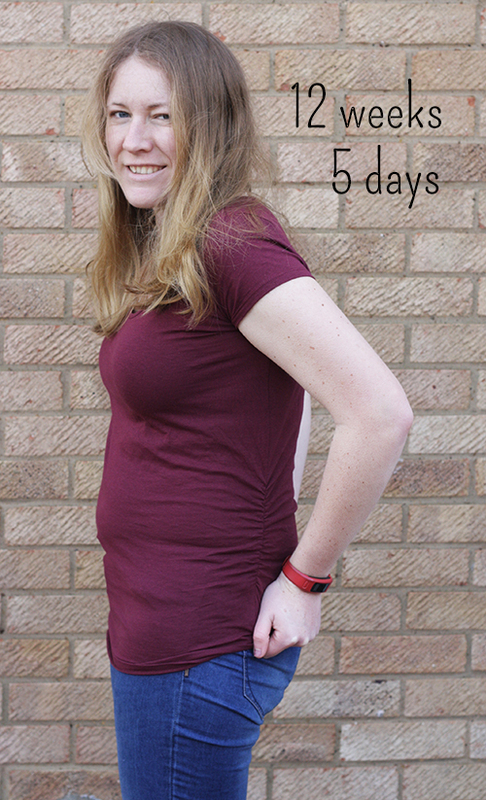 I am sure I am going to be overtaking nobody at 6 months pregnant…especially any super-fit short-wearing rugby guys! I’m so pleased you’re still running. I had intended to, but bar a couple of parkruns and a 5 mile trail race, I was simply unable to. I’ll have fun following your adventures instead! I swear, there must be a market for a maternity sports bra out there! Thanks Helen. Touch wood, all going well so far, although some days seem to be better than others. It seems to almost be in an uncomfortable position at times, which is no fun, but fingers crossed I can keep going til the end! I bought a Berlei sports bra as recommended on a Facebook group a few weeks ago and it has been a life saver! It isn’t advertised as a pregnancy bra, but it seems to be one of the few bras out there which come in bra sizes rather than S/M/L fittings and I haven’t even known that I’ve been wearing it, it’s that comfortable. I missed the news while I was away- Congrats!! Congrats again I’m so stupid I never saw the clues haha. I just have no clue when it cmes to babies and pregnancies. I’m not worried about times. I’m viewing this as super strength training as I’m carrying an extra 8lbs on my runs at the moment! 😉 I am finding it interesting to see how my times drop/pick up across the weeks though. Definitely very thankful that I am able to continue running. I am not sure how I would be able to cope otherwise. I would literally go crazy!